And that one thing was simply to view the clips. We did that in the course of writing this story and not just to illustrate it. We found the clips very useful in reminding us of the more important issues we confronted during the event. And we have to admit that we were more than a little anxious about viewing them. Just as we were pretty anxious about listening to the hidden audio we recorded. In fact, we didn't play it back until we had copied it from the recorder to our hard drive, only opening the copy. We were that worried. So the father of the groom was actually the first person to look over the video. And he gave it a thumbs up. But then he looks good in a tux. Not until we listened to the audio and tossed the video into a couple of sequences (one for each camera) did we begin to appreciate what we had. Then we showed it to a few visitors, two of whom are about to be married themselves and were thinking of skipping video. And our appreciation deepened. But before you take out your tissues and dab at your red, swollen eyes at the touching, heartfelt conclusion to our story <g>, let us repeat our warning. Hire a pro. Dancing. Almost no light, so we enhanced our screen shot with the Polaroid SX70 Overexposed filter from Film Stocks 1.5 to get this effect. We were only a little bemused to discover on returning home and researching our report that Marisa Bettencourt, one of the still photographers, is married to David Bettencourt, an Emmy Award-winning videographer who does this stuff for a living. Had we known at the time, we would have shown him the X-rays of our arthritic knees and rattled the two Aleve pills left in our bottle to get him to shoot the wedding. Really. While we have some experience as a photojournalist over several decades and know how to navigate and report events, that is a skill that must be acquired, preferably not at the first wedding you ever shoot. It takes knowing where the line is between getting into position to capture the shot and becoming part of the scene. You have to be both engaging and distant. That's not something you learn in Kindergarten. Then, too, shooting video is a universe away from still photography, with its own sun and planets. Although we got our start in photography making Super 8 movies, we prefer the genteel sport of shooting stills with a martini (or flute of champagne) in one hand. And really one of our biggest disappointments in accepting this job was the thought we'd have to give up our still camera. And the champagne. Nevertheless, we came home with 113 stills, more than we used to take with our film cameras. But even if you're competent to shoot video, the role you play at the wedding changes. It becomes a job. You work. Your date or spouse will be entitled to some form of compensation. Because you really aren't there as a guest. We have a strict rule: copy the original. Play the copy. Never the original. Stuff happens. The wrong button gets pushed. You're interrupted. You forget. That one and only original gets damaged, lost, erased. So we follow our strict rule. And suggest you do too. In our rush to pack for the trip while running a major international corporation (yep, this one), we forgot to bring a USB cable with the right connector for the Olympus DS-30 recorder. So what had been recorded on that device, stayed on that device. Until we got home. Then we copied the files over (one from the rehearsal, one from the wedding) and listened to them. We would (almost) agree to do this again on the condition we can plant an audio device on the groom. We're going to have a hard time going to any wedding in the future without trying to slip our DS-30 into the groom's jacket pocket. For one thing, it is the only thing that captured the bride's vows. The audience didn't hear them because the mic amplifying the ceremony didn't pick it up. We're pretty sure the groom heard them because he was smiling the whole time. And we know the celebrant heard them because he knew when to continue the ceremony. Everybody else was just being polite. But what we didn't expect was the groom's color commentary on every from the waiting room to the tent, waiting for his bride, during the ceremony and after, during photos. He's a charming guy, quite entertaining, in fact, but more than a few times, he was even genuinely moved. Just one example. When he saw the bride for the first time, walking toward him with her father, he gasped, "Wow. Oh my god." She's going to cherish that little snippet. So we're glad we augmented the audio, no question. And we'll miss it in the future as just another face in the crowd waiting for the bar to open. Funny thing. Looking at the tight crop of the couple during the ceremony, it was hard to tell what their movements meant. You just aren't looking directly at them. So it's more of a silhouette but one that's constantly moving. We're very happy we thought to leave the camcorder running on the tripod and wander up the sides to catch video of the bride facing the groom and the groom facing the bride. From that angle, you can see how they felt about the ceremony. And each other. It was also the only way we could capture both the bouquet toss and garter toss. 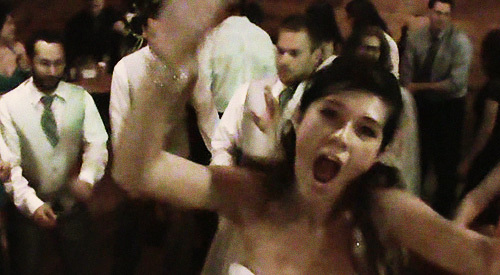 The camcorder stayed on the bride and then the groom while the handheld camera followed the action on the floor. Those two clips should cut together well. Of course, a second camera would have been useless without the tripod. So what may seem like an extravagance is really just a good idea. We spot checked the clips using Adobe Bridge CC and allayed our worst fears. Except for a couple of them, the exposure was good. Focus was sufficient, let's say, in the dark scenes, although it drifted. Tripod shots were solid but our handheld stuff would be helped by a little stabilization. So would some panning. That's the technical stuff and there's some really impressive technology to deal with those issues in post processing no matter which product you use. We knew that going in. Capture the Theme. 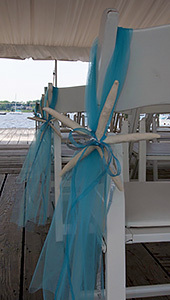 Starfish hung from the chairs along the aisle and everyone took home a sand dollar favor instead of those match covers with the name of the couple and the date. We did manage to get one walking-the-floor shot (but it is a remarkable wood floor of king pine) when we forgot to turn the camera off but it was redeemed by a shot of the cake at the end when we realized what we had done. There was a completely dark clip when the exposure took a holiday but audio on the clip will come in handy. Otherwise, we didn't miss anything. We got all the shots the groom had asked for. We knew that because, rather than view clip after clip, we combined them into two long sequences, one for each camera, in chronological order. We used a cross fade transition between them just to make it a little easier to watch. All of which took less time than it takes to describe. And watching both clips we had, for the first time, the sense of attending the wedding. There was a difference between the ceremony and the reception segments, though. It really paid to go to the rehearsal. We knew when to stand where. At the reception we weren't always in the best spot and we couldn't move around. So we did the best we could. To make the viewable clips (which we copied to our first generation Apple TV to make viewing convenient), we used Adobe Premiere CC, which is as high-end as we could get. And another reason to let a pro do it. Because not only do you end up using Premiere but you need After Effects CC, Audition CC and Adobe Media Encoder, among others, to polish the presentation. Toss in Photoshop to prep any of the stills you may want to include in the production and that Creative Cloud subscription begins to look like a good deal. Still, it's a lot to learn. With the new CC versions, there's a lot to learn even if you already know Premiere, After Effects and Audition. But there's also a lot of online resources to demonstrate how to do things in nice little 10-minute video tutorials. The alternatives on our hard drive are Premiere Elements (with which we just did a short DVD video production before leaving for the wedding) and iMovie. We plan to explore those options, too, but we thought we'd tread some water updating our Premiere expertise while we recovered from jet lag. The only two issues we found with using professional-level software were: 1) understanding some pretty arcane terminology and 2) knowing what you want to do. Sound guys, for example, have their own language. You may cringe when you hear the wind batter the unprotected mic on your camera (tape some gauze lifted from a band-aid over the microphone holes on your camera) but how do you filter that out? You'd better learn the language. Turns out there's a Curve command for audio that functions much like its equivalent in image editing software. You can increase or decrease volume based on frequency. So some curves are better for some problems than others. You just have to know what you want to do. Even knowing what you want to do, though, can lead you down some rabbit holes. We had some confusion about our production's specifications that led to some terrible renderings of the camcorder footage. Then we learned how to set up the project's settings and the footage improved dramatically. We had some handheld shots we wanted to stabilize. But there's more than one way to stabilize (smooth motion or no motion) and then there's the question of batch processing or just swapping out the clip in the sequence. Oh, and a sequence is merely a finished scene made up of any number of clips, transitions, audio, etc. String a few together and you have a movie. Or you will when you export it. In one of a million different formats. By now, though, the software is mature enough that brute force isn't required. Better to use the online resources to learn how something is done than to learn one command and throw it at every clip. For example, you could go crazy trying to sync audio to separate video tracks. Or crazier trying to manually sync multiple camera angles of the same scene. But you can sync on the audio itself in Premiere. It's stuff like this that gives you the overwhelming feeling production will take months even if you can get a rough cut out in a few hours. Check out the venues in advance. Both for the ceremony and the reception. Record the audio separately. Don't rely on the cameras. Shoot with more than one camera. Get the main scene going on a tripod-mounted camera you can leave to capture alternative angles of the action. And even shoot some stills. Those three tips will upgrade your final production enormously. They will also make you famous and stuff your pockets with millions of dollars. Or maybe just win you an Emmy. In Confucius -- The Secular as Sacred Herbert Fingarette, our old Philosophy professor, explained that Confucius found something magical about making a request. Asking someone to do something almost always results in a yes. We have a hunch that's how this marriage business got it's start, in fact. The groom asked the bride to marry him and she just couldn't say anything other than yes. So if we've turned this tale into a four-part lesson, it's because we realize it is always impossible to say no to someone you love. No matter what they ask. We weren't the best person for this job, but by the time we're done we hope they can't tell. And we hope you can learn a trick or two from our experience, too.